Hey friends! I hope this finds you well. It’s time to recap everything we did in February. This month was good for us in many ways. We took a last-minute trip to the coast to soak up some much-needed sunshine, John went skiing while I had a treat-yo-self weekend, we spent some quality time with new and old friends, I strangely got really into taking baths (a first for me), and I read some amazing books (see my favorites below!). I hope your month was just as awesome. Thanks for reading along this month! We sincerely appreciate it. We have so many exciting things coming up this month (recipes and otherwise), so be sure to tune back in for an exciting March! But for now, let’s kick things off with eats. This month was so dang delicious. My favorites were definitely the Breakfast Cookies and Spicy Red Lentil Curry. So yum. What did you love? We sent out our second Bonus Recipe yesterday! Did you get it? We hope you love it! In case you missed the news, email subscribers are receiving one FREE BONUS RECIPE every month in 2016 that won’t be shared anywhere else! 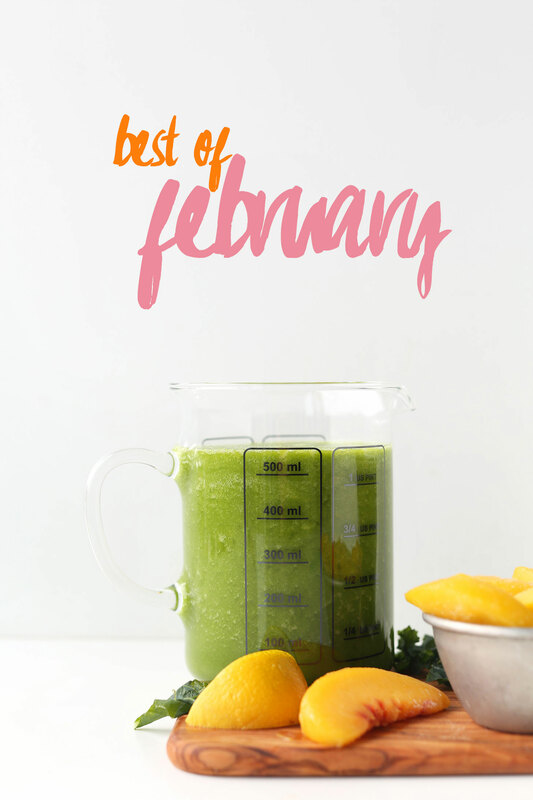 Sign up now to receive February’s bonus recipe, and to be on the list for next month’s as well. We also met Jess Lively from the Jess Lively Show this month (!! ), and she’s just as lovely in person as she is on the show. In case you missed our 2014 interview with her, check it out to learn more about background and how we adapted a simple lifestyle. I’m still loyal follower of her show and a few of my favorite recent episodes have included Alex Ikonn (who spoke on productivity), Alisa Vitti (who spoke on embodying pleasure), and Monique from Ambitious Kitchen (who spoke on making healthy baking swaps). Listen – John shared the BORNS album, “Dopamine,” with me early in February, and it’s been on repeat in my office ever since. Also, Beyonce’s new song, because, obviously. Watch – I’ve been super into Snapchat this month! If you don’t follow me, find me at username: minimalistbaker for behind-the-scenes action and random thoughts. It’s so fun, you guys. Drink – Golden milk. All hail golden milk. 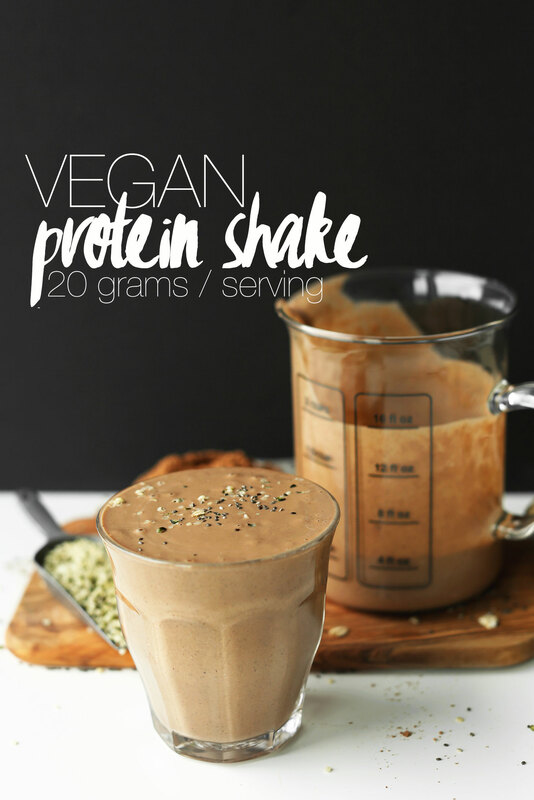 Nutrition Stripped’s recipe is on point! If you don’t know what it is, check out her post for all the health benefits and a recipe video. Eat – A shout-out to my friend, Andrea, of Dishing up the Dirt. She’s been inspiring me with her food photography and farm-to-table recipe vibes. She and her husband operate a farm about an hour from Portland, which is oh-so dreamy. Check her out if you’re looking for some whole food inspiration. Read – This month I loved both the “The Hormone Cure” and “The Woman Code,” which were incredibly eye opening and helpful in the realm of women’s health. If you’re a lady and are curious about, or have struggled with, your hormones, these are excellent reads! In March I’m still crushing on lentils and chickpeas (are you surprised? 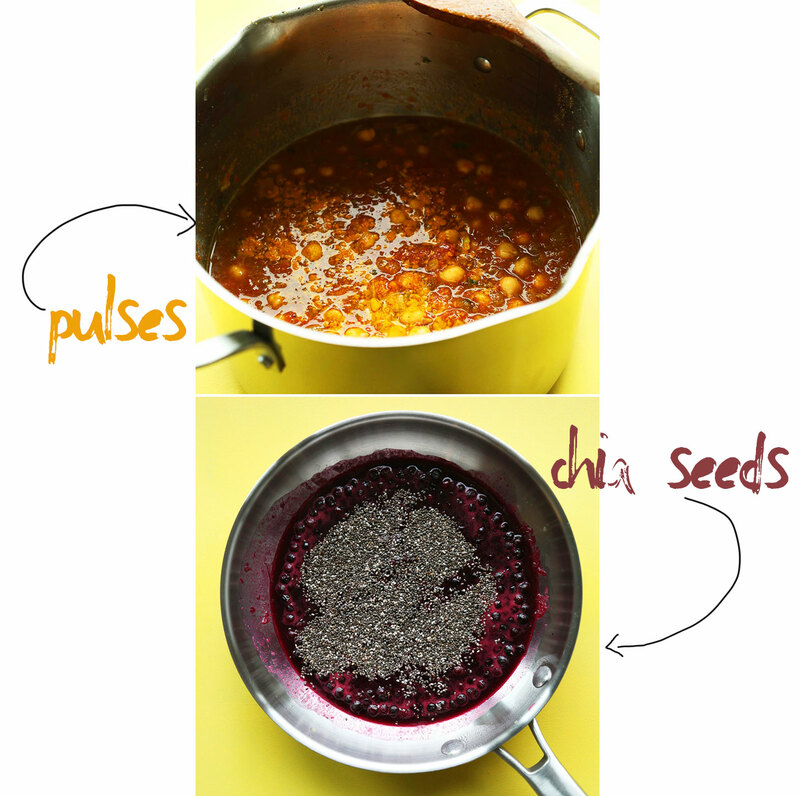 ), as well as chia seeds! So healthy and delicious. I have yet to discover a month of Minimalist Baker that WOULDN’T be delicious! Your spicy red lentil curry and vegan meatballs were the stars of the show, but I loved every recipe you posted this month! I will definitely try out the lentil curry and let you know how it tastes–I never would have thought of mixing tomatoes into curry! You should get it soon, if not already. Be sure to check your spam folder, as it sometimes lingers there. And be sure to add us to your contact list! Thanks Carla. I have fallen in love with your almond milk. I make it about every 3-4 days. I am accumulating a lot of almond meal. I don’t peel my almonds before I make almond milk, nor do I have a dehydrator. What can I do with all this almond meal? I hate to waste it and just toss it. Currently it reside in the freezer… I’l love to make a wonderful cracker, but everything I have tried is really pretty awful. Any great ideas or recipes to share? Love your blog. I’ve shared it with many. Thank you!! Hi Sue! I believe you can slightly dry it out in the oven at 350 for 5-10 minutes (on a baking sheet). Then you can use it in baking anywhere it calls for almond meal! I haven’t found a cracker I like either, but I’ll definitely add that to my list! Well, I only got around to making the Kale and Ginger smoothie recipe (which I have made many times this month!) and the vegan chocolate candy (yum!). I love both of these recipes! I am adding the red lentil curry recipe to my list to try in the near future. Keep ’em comin’ MB!! I am a subscriber and did not receive the bonus recipe. I did check my spam folders and it is not in there. Can you please send to me? Thanks! I just resent it and can see it was sent yesterday at 3:00p your time as well. If you’re still not seeing it in your inbox or other folders, my fear is that your firewall isn’t letting it through. You can also try unsubscribing and resubscribing, which might correct the issue. I got it!! Thanks so much! Check your spam and other folders (such as the “promotions” tab)! It likely ended up there. I didn’t receive mine either and have check everywhere you suggested and other folders too JIC and do not have it. Even searched in all my folders. Sorry. I just resent it to you and can see it was sent yesterday at 3:00p your time as well. If you’re still not seeing it in your inbox or other folders, my fear is that your firewall isn’t letting it through. You can also try unsubscribing and resubscribing, which might correct the issue. “The Woman Code” is a life saver. I read it about a year ago changed my diet accordingly- your recipes make it so incredibly easy to eat according to the list of recommended foods for each phase. Your Spanish quinoa stuffed bell peppers, hummus and chocolate beet muffins are a staple at my house every month. :) I’ve been so excited to see your red lentil recipes lately as that’s one thing I’ve had trouble incorporating into my diet. Looking forward to March!! My mouth is watering!! I can’t wait to try the lemon bars and the lentil curry!! Thanks for sharing your February with us! Aw, it was such a privilege and joy to be able to spend time with you + John! I have the warmest, fuzziest memories from that experience and I’m so grateful. I hope to spend time with you again soon! Oh man, we are loving BORNS, too! Michael and I saw them preform at a tiny little venue in LA about a year ago for like $5, and when we left the show we both looked at eachother like – Yup, these guys are gonna blow up. I think it’s going to be a great “summer anthem” album!